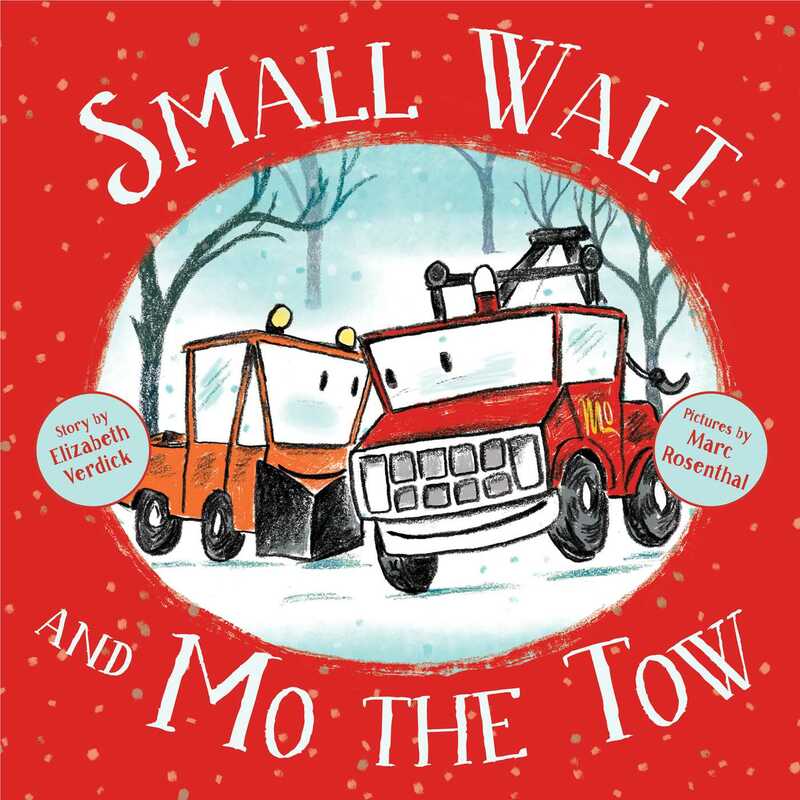 Small Walt befriends a tow truck when he comes across a car in need of help in this irresistible companion to Small Walt, which Kirkus Reviews called “charming and endearing” in a starred review. A bitter blizzard. A snowbound town. When a car skids off the road, Small Walt and Gus might not have what it takes to save the day on their own. But who does? Mo the Tow to the rescue! Text filled with onomatopoeia and Walt’s affirming chants make this story about friendship and accepting help from others a real winner. Elizabeth Verdick has written more than thirty books for toddlers to teens. She collaborated with Marc Rosenthal on Small Walt, which Kirkus Reviews called “reminiscent of Virginia Burton’s classics” in a starred review; its sequel, Small Walt and Mo the Tow; and Bike & Trike. She is a graduate of the Hamline University MFA and lives in Woodbury, Minnesota. Learn more at ElizabethVerdick.com. Marc Rosenthal is the New York Times bestselling illustrator of many books for children, including Small Walt by Elizabeth Verdick; I Must Have Bobo, I’ll Save You Bobo, and Bobo the Sailor Man, all by Eileen Rosenthal; The Straight Line Wonder by Mem Fox; and Phooey, which he wrote. Marc’s illustrations can be seen regularly in The New Yorker, Time, Forbes, Fortune, The Atlantic, The New York Times, The Boston Globe, The Washington Post, and others. Visit him online at Marc-Rosenthal.com. In this outing, Walt and Gus, making their rounds, see a car skid into a snow-filled ditch. Can they help? Despite his can-do spirit, Walk must now learn to deal with his limitations . . . Mo and Sue are the pair with the hardward and skills to perform this rescue--except it turns out they can't quite reach the stranded car; first they'll need some snow cleared. Are Walt and Gus up to it? No spoilers. Suffice to say all these characters have something useful they like to do and do well, and each has limits, too, making this a story about teamwork as well as pluck. . . . The characters are appealing, the and the language is active and satsifying, with plenty of onomatopoeia. . . . The flap copy tells us that "Small Walt" has been called "reminscent of Virginia Lee Burton's classics," and this book will be, too; the cover design practically dares you not to think of "Mike Mulligan and His Steam Shovel." Rosenthal's drawings feel like a contemporary take on Burton's spirit, though, rather than something derivative: Burton, after an espresso. The lines and colors are direct, cheerful and effective. They look like the work of someone in a good mood, and the put me in a good me to look at them. Snow is less a scenic backdrop than the principal antagonist in the cheerful, can-do pages of “Small Walt and Mo the Tow” by Elizabeth Verdick. In this sequel to 2017’s “Small Walt,” the doughty little snowplow Walt and his driver, Gus, watch with alarm as a green sedan skids off a snowy road into a deep ditch: “Fwump!” To Walt’s dismay, the rescue job is too big—“My plow is tough, / but it’s not enough”—so there’s relief all round when Mo the Tow and his driver, Sue, trundle into view. But what’s this? Mo’s tires are slipping in the snow? “Walt to the rescue!” Children ages 3-7 will rejoice as in Marc Rosenthal’s retro illustrations the little plow surges into action, rays of purposeful energy shooting off his red chassis.